New Arrival!! Just The Black Beauty 4X4 Colorado For You. Clean CARFAX. Navigation, Heated Seats, Remote Start, Rear Back-up Camera, Bluetooth Hands Free, 4X4, Tow Package, 3.6L V6 DGI DOHC VVT, 5" Rectangular Black Assist Steps (LPO), All-Weather Floor Liner (LPO), All-Weather Floor Mats, Bed Protection Package (LPO), Black Bowtie Emblem Package (LPO), Black Spray-On Bedliner w/Chevrolet Logo, Body-Color Grille, Bose Premium 7-Speaker Audio System Feature, Drop-In Bedliner w/Tailgate Liner (LPO), Exterior Convenience Package (LPO), Front & Rear Splash Guards, Soft Folding Tonneau Cover (LPO), Wheels: 17" Black Painted (LPO), Z71 Emblem (LPO), Z71 Midnight Edition. 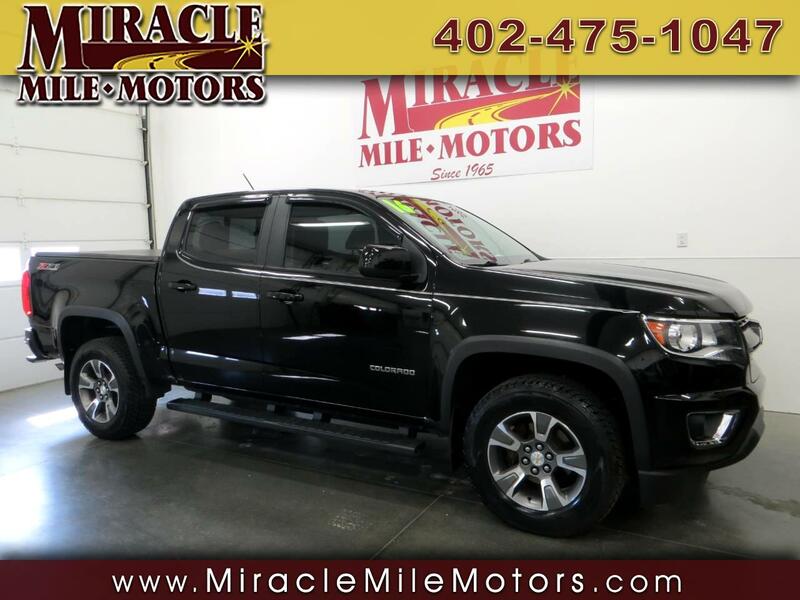 2016 Chevrolet Colorado Z71 4D Crew Cab 6-Speed Automatic 4WD 3.6L V6 DGI DOHC VVT Miracle Mile Motors in Lincoln NE have been in business for over 50 years selling premium quality used cars, trucks and SUV's vehicles. We are committed to save you time and money and make your buying experience hassle free and pleasurable. All of our prices are clearly displayed on each vehicle. We offer bank financing , service contracts, and Carfax reports. NO DOCUMENTATION OR HIDDENS FEES. Word of mouth is our best advertising. Please look thru our inventory at www.miraclemilemotors.com or e-mail with any questions. 1-888-465-8963 87th & Hwy 2 Lincoln, NE 68526 Where Friends Tell their Friends to Buy CarS. Recent Arrival! Odometer is 8824 miles below market average!